Test your knowledge and understanding of Class Cephalopoda by completing the quiz below. Is the cephalopod shell shown above evolute, convolute, or involute? The shell has convolute coiling because the youngest whorls partially cover earlier whorls. Aptychi are paired structures that look superficially like bivalve shells. They are thought to be parts of the bodies of ammonoids, but their function(s) remain uncertain. What are the structures called that separate the internal chambers of nautiloid and ammonoid shells? Sutures. These are relatively simple in shape in nautiloids, but much more complex in some ammonoids. Is this shell a nautiloid or an ammonoid? How do you know? The shell is a nautiloid. Its sutures are very simple in shape. If it were an ammonoid, the sutures would be much more complex. What is the primary function ofchromatophores in modern coleoids? Chromatophores allow coleoids to rapidly change color. What specific kind of cephalopod is shown above? 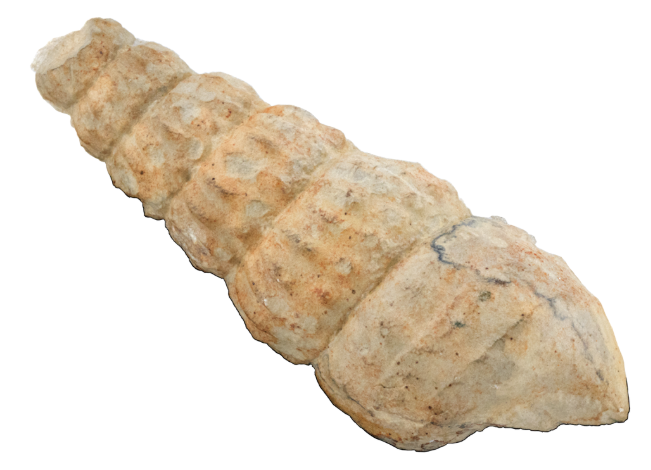 This is a baculite, a type of straight-shelled ammonite. 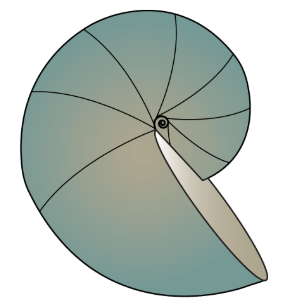 Characterize the shape of the cephalopod shell above (it looks like a snail shell, but is not). 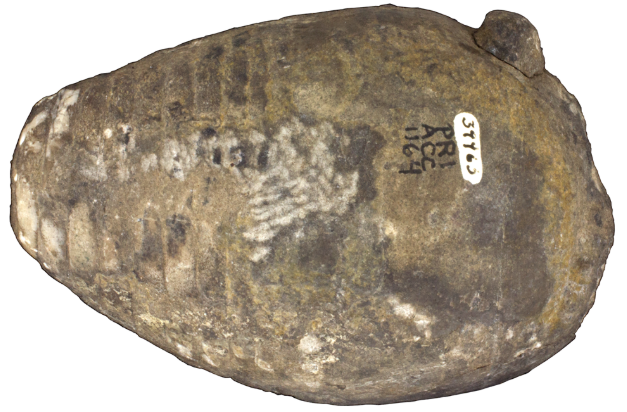 This specimen of heteromorph ammonite has a torticone shell. What quality most readily separates heteromorphs from other ammonites? 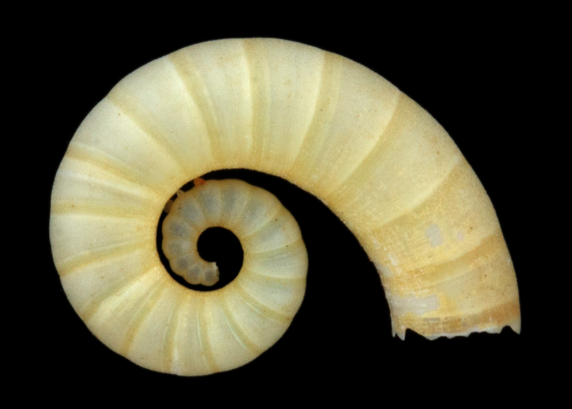 The shells of heteromorphs are irregularly coiled (as opposed to the typically planispiral shells of most ammonoids). Characterize the shape of the shell shown above. The shell is a gyrocone. It is curved, but earlier whorls do not touch each other. During which geological interval did nautiloids reach their peak diversity? Nautiloids reached their peak diversity during the late Paleozoic. A gladius is an rigid internal body part found in some ancient coleoids and the modern vampire squid. A phragmocone comprises the chambered portions of a cephalopod shell. The remainder of the shell is occupied by the living animal and is called the body chamber. What kind of modern shell is shown in the image above? What kind of fossil is shown in the image above? Beleminte. Belemintes were internal shells (guards) of squid-like animals that lived during Jurassic and Cretaceous periods. 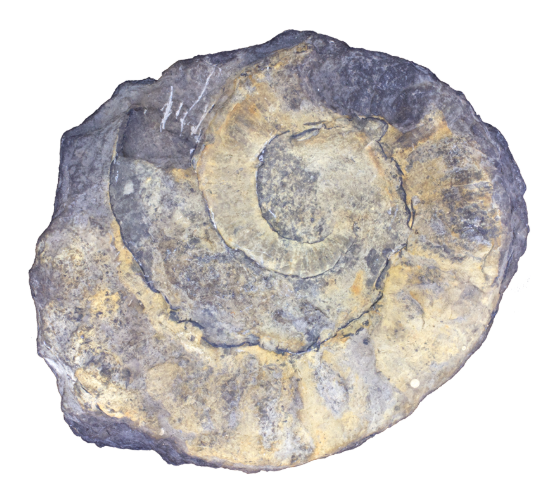 If you find an ammonoid fossil with a suture pattern that looks like the one above, most likely when (what period(s)) did the ammonoid live? This is an ammonitic suture, so the specimen is likely from either the Jurassic or Cretaceous period. During which geological period did this cephalopod most likely live? 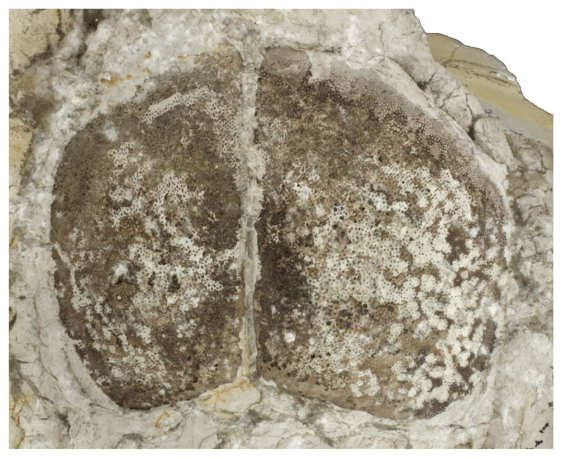 This specimen has a ceratite suture, indicating that it is an ammonoid that probably lived during the Triassic period. Ammonoids and coleoids are both thought to have evolved from one particular group of nautiloids. What is that group? Ammonoids and coleoids are thought to have evolved from bactritids. Characterize the shape of the shell shown above AND identify the tube-like structure that runs down the center of the shell. The shell is an orthoconic longicone (=straight, long shell). The central tube-like structure is the siphuncle. Do members of any major group of modern Coleoidea typically have internal shells? Yes. Cuttlefish have internal, chambered shells called "cuttlebones." What structure is indicated by the top arrow? What structure is indicated by the bottom arrow? The top arrow indicates the siphuncle. The bottom arrow indicates a single septum. All living Coleiodea are active predators, with a single known exception. What is that exception? The vampire squid. This species (Vampyroteuthis infernalis) uses a long filament to feed on detritus suspended in seawater. 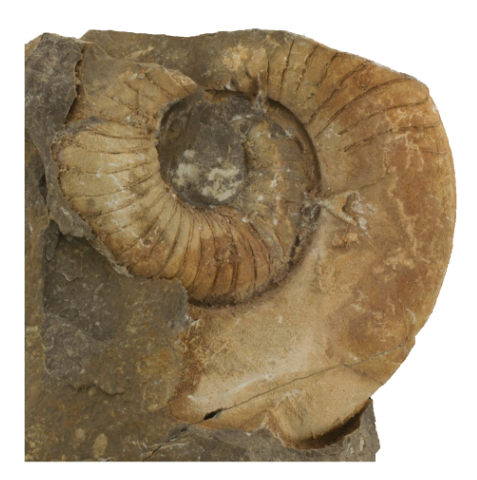 When did the ammonoids go extinct? At the end of the Cretaceous period (=end of the Mesozoic era). Characterize the shape of the shell above. Shell is an orthoconic brevicone (=straight, short shell). Characterize the shape of the cephalopod shell above. The shell is a cyrtoconic longicone (=curved, long shell). Which one of the following IS NOT a feature shared by all cephalopods? c) External shell. Coleoids do not have external shells, though cuttlefish have an internal shell, as did belemnites. During which geological period did Nautiloidea and Coleoidea--the two major groups of extant Cephalopoda--likely diverge from one another? Nautiloidea and Coleoidea are thought to have diverged from one another during the Devonian period. In other words, the shared common ancestor of the modern chambered nautilus and a squid lived during the Devonian. 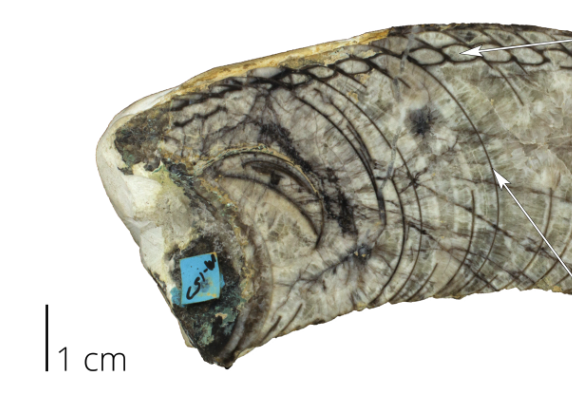 True or False: Cephalopods with ceratite sutures are completely extinct. True. 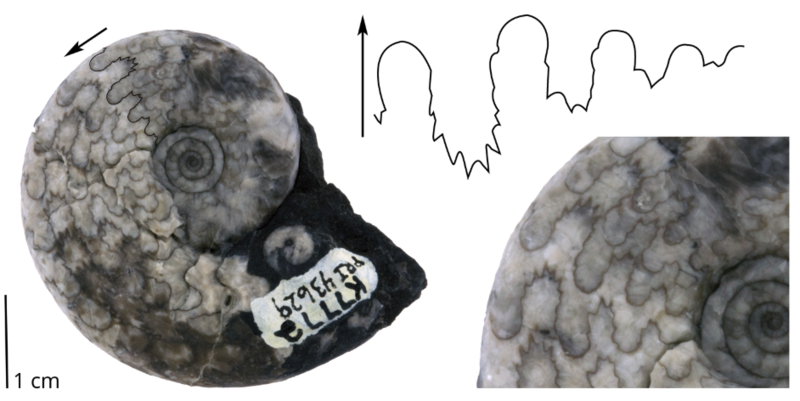 Some ammonoids had ceratitic sutures (especially during the Triassic period), but all ammonoids are now extinct. To which major group of cephalopods do octopuses belong? Octopuses are coleoids. 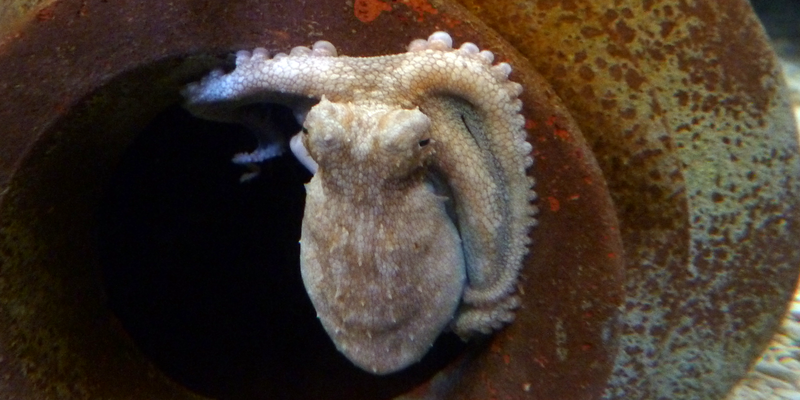 More specifically, they belong to the group of coleoids called Octopodiformes. Cuttlefish, squids, and belemnites are also coleoids. Which one of the following is an example a member of the Decapodiformes? c) Decapodiformes. The name means ten feet; squids and cuttlefish both have ten arms and are part of this clade.